Rudy Wingate is now studying music education at Norfolk State University. Rudy Wingate could have become another statistic – another special-education student left behind in life. Instead, he is a college graduate working toward becoming a music teacher. 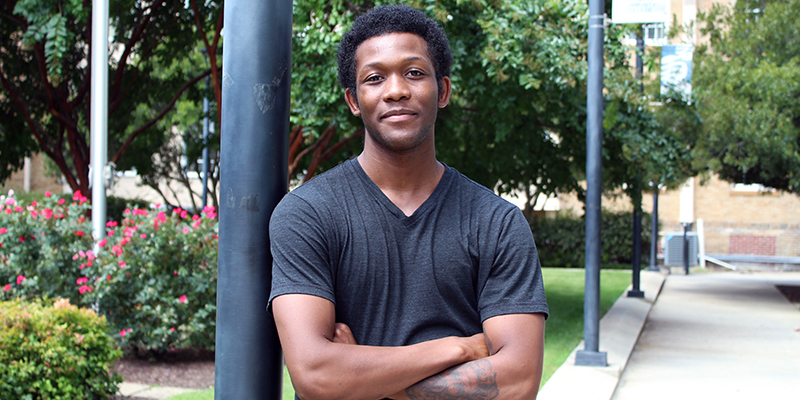 “I came to TCC and learned that I could learn, and that was a great surprise,” said Wingate, who earned his Associate of Applied Science in General Studies from Tidewater Community College in May 2017. He completed the two-year degree in three packed semesters and is now studying music education at Norfolk State University. While at TCC, Wingate found a passion for music by taking a guitar class. After one semester, he was proficient on both guitar and saxophone and participating in two TCC music program ensembles. “It was like a lightbulb went on, and music just clicked with me. I was surprised at how fast I was learning, and not just in my music classes,” he said. Wingate found support from his academic advisors, teachers and pretty much everyone on the Norfolk Campus. He credits counselor Mark Flanders, who helped him develop a career plan. His introduction to education hindered his progress prior to his college years. Wingate repeated second grade and was placed in special education classes because of behavioral issues. Even though he was smart enough, he was never part of a mainstream classroom after that. “In high school, I would score well on SOLs, but I didn’t know how to act. I really didn’t learn what other high school kids were learning,” he said. Meeting Jahkari “J.T.” Taylor, a special education teacher with Chesapeake Public Schools, changed his direction. “He saw something in me and encouraged me to go to college. He even helped me with the admissions process to TCC,” Wingate said.